Recently, a frustrated mom sat in my office and said, “I just don’t know what to do anymore. We’ve tried everything! There’s no punishment that gets through to our child; there’s nothing we can say that will fix her behavior. There’s so much going on we just don’t know where to start.” Sound familiar? Parents often get by on intuition and advice from others, but let’s face it–that’s not always enough, especially if you have a child who doesn’t respond well to your attempts to manage their behavior. All kids push the limits, but the stress this causes parents can range anywhere from overwhelming to nearly unbearable. There are so many parents out there who would give anything to have some peace and quiet at home, and peace of mind about their family life. 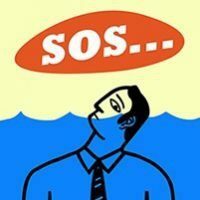 Not only are you struggling to keep your head above water, you’re caught in a flood of behavior issues that pop up one after the next— and you may also be struggling to just hold on so you don’t get swept away. 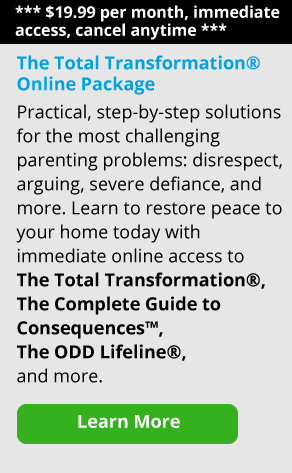 If your child has ODD or ADHD, it can feel like every day is a new parenting obstacle course. What I say to parents who come to me feeling this way is, first take a deep breath. You’re not alone. And what’s more, you didn’t find yourself in this situation with your child all at once, so you don’t need to put pressure on yourself to climb your way out of it all at once, either. We all go to that place of fear and negativity when we’re anxious about our kids or our parenting. Fear says, “You have to fix this right now or else!” But if you put that feeling aside, logic might tell you that you and your child are both human, and can only do so much at one time. So instead of trying to turn around five years worth of issues in a matter of minutes, it’s more effective to think about one thing you can start doing differently today to be a more effective parent than you were yesterday. Once you’ve shifted your thinking a bit and taken some pressure off, there are some other practical steps you can take to start to regain your sense of control and confidence as a parent. Here are some of the suggestions parents have found most helpful over the years. Then ask yourself, are there safety issues because of this behavior? Issues that pose a safety risk, either to your child or to others, should always be dealt with first. Once you’ve considered any safety risks, rank your top three concerns in order of priority—and the top issue on the list is where you put your focus for now. Those other two things might need to wait until you build up your confidence and have more energy. Working on just one thing is enough. Remember, when tackling multiple behavior issues as a parent, it’s important for you to take one step at a time. Eventually, those steps will add up to better behavior and more effective parenting. Before you talk with your child, you should also come up with a plan on how you will hold her accountable. What will you do if she does not meet your expectations? How will you respond? In the moment, it’s most effective to restate your expectation and then walk away. When things have calmed down, problem solve and then give a consequence if the situation calls for it. When you have established your plan and you are sure you can follow through with it, clearly state your expectations to your child and let her know what is changing. 3. Fewer speeches, more coaching. In The Total Transformation program, James Lehman tells us that parents often over-explain themselves because they think this will make their kids understand. The truth is, lectures and speeches aren’t effective. James recommends instead to have conversations that are focused on what your child’s responsibilities are, and how he can meet them. For example, what can your child do instead of leaving the house without permission when he thinks you’re being unfair? How can he stay out of trouble next time? It’s extremely important for you to take on the role of “coach” and help your child learn new behaviors that are more effective. Put things in your child’s best interests, rather than trying to convince him he needs to change so he’ll get into college, stay out of jail, or be able to keep a job in 10 years. Set the speeches and justifications aside, and focus on developing the skills your child needs to do better. Let your consequences do the convincing. 4. One step forward, two steps back. It’s important to expect setbacks with progress. Change is a slow process that you just can’t rush. Think of the caterpillar inside a chrysalis, awaiting the day he is ready to break out and take flight for the first time as a butterfly. That caterpillar knows he can’t speed up his transformation without jeopardizing his well-being. He knows that the time will come and he must be patient. It’s far more effective for a parent to also take one day at a time, and take it slow when making changes at home. Things will get better, but sometimes your child will still make a mistake. All is not lost—just take a deep breath, follow through with your plan and remember that you can handle this. Start with a fresh slate each day and stay positive. 5. Be empowered. There is power in numbers. Whether you’re a single parent, happily married, or somewhere in between, parents need a support system. Find a way to build in some time for some social support each week so that you can recharge your batteries and feel refreshed and motivated to continue on. If the problem feels too big for you to handle within your family or social circle, seek support elsewhere. This is not a sign of weakness, but a measure of resourcefulness, commitment to change, and a good way to add some more tools to your parenting toolkit. Your child’s pediatrician, teachers, and this website are a good place to start. All of these resources can help you gain a new understanding of your child, make suggestions, and help you to figure out what next steps you should take if you feel like you keep running face first into a brick wall. Parenting classes, support groups, or counselors and therapists in your local area can also be a huge help. When you’re faced with so many behavior issues you don’t know where to start, it’s not easy. Remember, your journey toward more effective parenting will start with just one step. And by accepting that this will take time and choosing to be positive and have patience, you can take that first step toward progress, starting today. Sara Bean, M.Ed. is a certified school counselor and former Empowering Parents Parent Coach with over 10 years of experience working with children and families. She is also a proud mom. 2. Manipulative Child Behavior? My Kids Are "Too Smart for Their Own Good"